Sok Somphoas Phalyka is a Global Ambassador for InSTEDD. Phalyka is a B.A graduate majoring Media Management. After having graduate, she spent most of her life working in media and communication field. She started working as a short contract communication officer in Credit Union Australia in early April 2014. 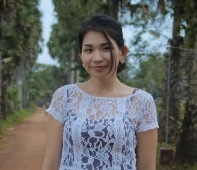 In June the same year, she was moving on to BBC Media Action Cambodia as a Radio Producer and later on was promoted to become a Radio Manager in October 2014. With the passion in well-being and technology, she later on join InSTEDD as a Global Ambassador in early March 2017.